There’s no question. The dreary weather and shorter days make it hard to stay motivated through the winter months. So how do we beat the cold weather blues? With a few helpful tips and tricks you can change your outlook on the season and stay motivated all year long! Vague plans like, “I’ll go for a run later on” or “I’ll go one day this week” are counter-productive to keep up your drive and motivation. It is much easier to evade plans that are not concrete. Try setting fixed times and dates for your runs. Writing these plans down in a journal or making a running date with a friend are good ways to hold you accountable and up the likelihood of you sticking to your schedule. Getting ready for a winter run can be just as much of a mental challenge as a physical one. Willing yourself to get ready and out the door is half the battle. Make sure that your body and mind are ready for the run by warming up first indoors. Running up and down the stairs, jumping rope or stretching exercises are all great ways to get your internal body temperature up and prepare you for your workout. Once you’re all warmed up, get right to it! Be sure to not stand around in the cold before! Even though it is cold outside, your body will still get dehydrated during your run. Make sure to drink enough water with the right electrolyte balance. Bringing a bottle of room temperature water or a sports drink can encourage you to keep drinking even in the rougher weather. Your muscles will thank you! Sometimes, self-motivation is not quite enough to keep you on track with your exercise goals. The colder weather can call for stronger incentives to get out there and get running. Plan a little treat for yourself for when you get home. Maybe plan a delicious dinner or schedule your run right before your favorite TV show. Knowing that you have something to look forward to can encourage you to stay on track. It is extremely important to have the right gear for winter running. From your head all the way down to your feet, each layer provides a different layer of protection from the cold and windy weather! It’s understandable to not want to spend a fortune on gear, however, if there was one thing to invest in it would be a good pair of running shoes! Especially in the winter when the terrain can be very rough and uneven, a good running shoe is paramount to protect your joints and muscles! Finding the right fit and support level will increase not only your comfort level but you’re all around stability and stamina. Tip: If you plan on being an active winter runner or tend to prefer running on natural trails, it’s worth getting some waterproof, strong profiled shoes. A properly fitted running shoe is perfectly complemented with a fitting sports insole. The Bauerfeind Sports Run & Walk Insoles ensure you are supported while running, hiking, or walking. Thanks to their Weightflex® technology you can enjoy sustained comfort on even longer runs! The right pair of shoes needs to be teamed with the right pair of socks. For the winter, it is ideal to go with a lighter sweat-wicking fabric that will keep you dry and comfortable. Compression socks can be a great option, not only are the light and supportive, they can help keep an active blood flow while running and prevent sore and achy muscles. When running in the winter it is easy to make the mistake of bundling up too much. Although the temperatures are low your body will warm up quickly once you get moving. 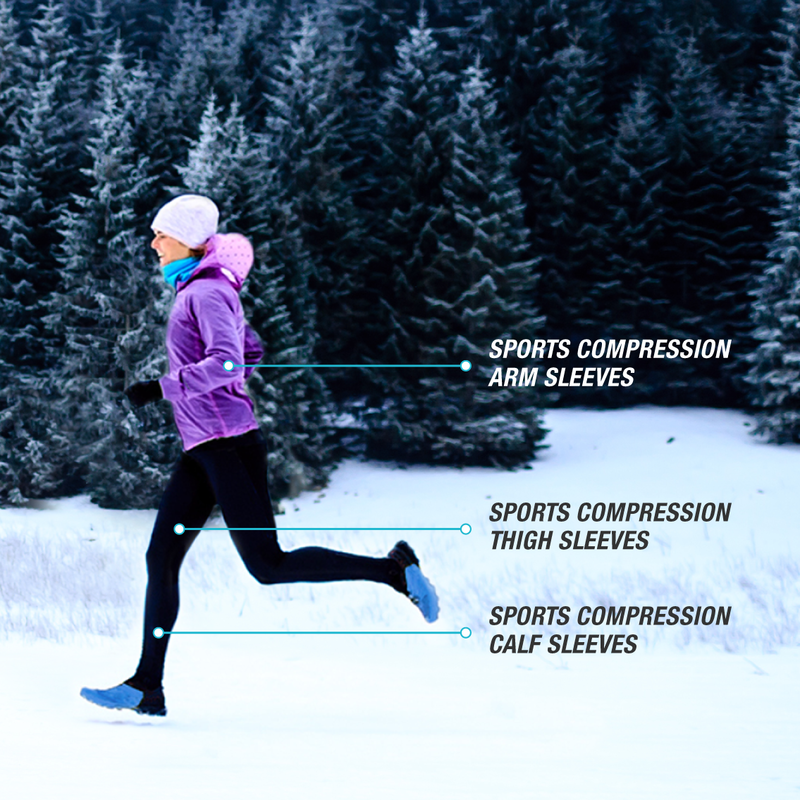 Dressing in multiple light layers is key for running in the winter. You can quickly adjust to your changing body temperature by simply removing on adding a layer as needed. Be sure to choose fabrics that are breathable, moisture wicking and light. A good temperature-regulating base layer is always a good investment for the winter. A layered ensemble topped with a waterproof jacket or windbreaker should keep you dry and comfortable all run long. Hats and gloves are an absolute must for runners! It is extremely important to keep your extremities well insulated due to the fact that heat escapes faster from these points. When the temperatures really drop, it is also recommended to wear a scarf or face protector– this helps to protect the lungs from cold icy air. 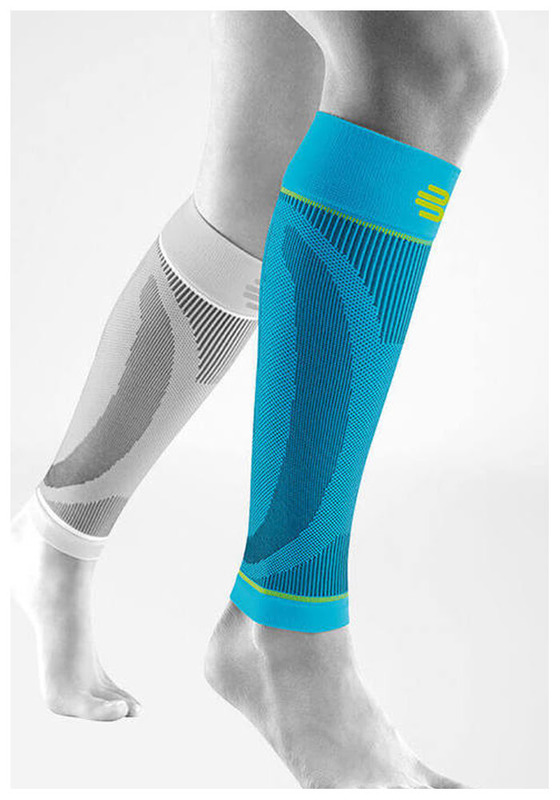 A good tip for people who tend to get cold easily is to wear Compression Sleeves. 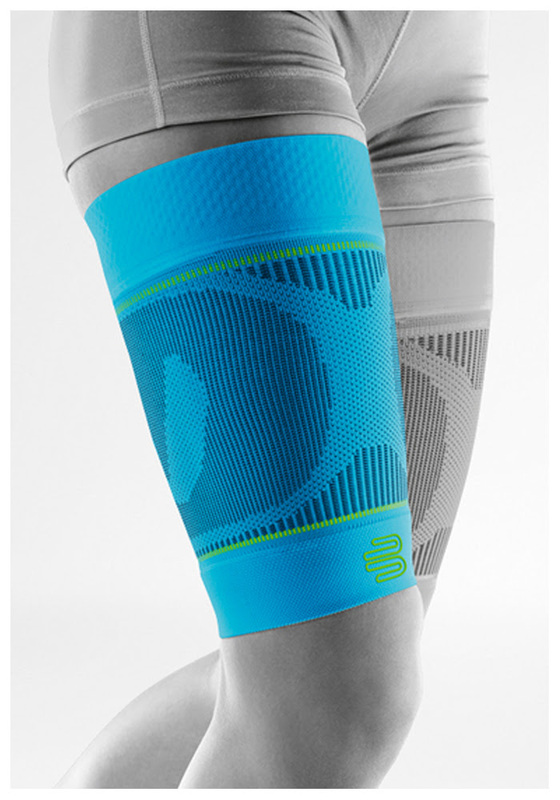 These sleeves lie tightly on the skin and improve the transport of oxygen through the body as well as blood circulation, keeping you in top performance!